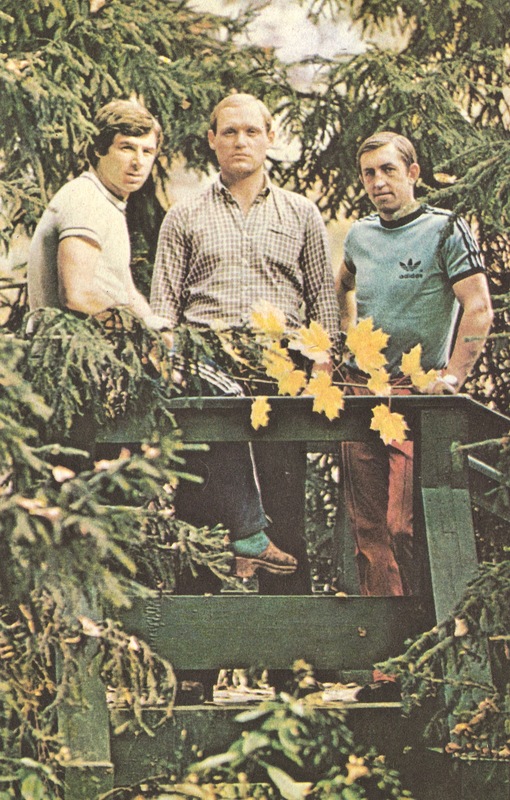 Sylvan Scene: Valeri Kharlamov (left, showing a spectacular clog) with his Soviet national team line mates, Vladimir Petrov and Boris Mikhailov, in a forest, on a bridge. That’s expert advice that Lawrence Martin received from a Muscovite contact in the fall of 1986 when Martin was stationed in the capital of the USSR for The Globe and Mail. Martin’s book on Soviet hockey, The Red Machine (1990), remains the best on that subject you’ll find in the West. If today, on what would have been Kharlamov’s 70th birthday, you’re on the scout for background reading on his talents and too-short life, start there. Here, let’s just note in passing that Kharlamov was born on a Wednesday in Moscow, in 1948. He was 33 when he died in 1981 in a highway accident that also killed his wife, Irina. My favourite phrase describing the verve and artistry with which Kharlamov played the game is Martin’s: “this Chagall of hockey,” he called him. If you go back watch that Montreal shocker of a first Summit game from September of 1972, the way Kharlamov spoons the puck around Canadian defencemen is enough to drop your jaw off its hinges. He had “the fakir’s ingenuity in handling the puck” Anatoli Tarasov said, by which I think he meant “dervish.” (I’m interested, either way, in learning where those ascetics acquired their pucks.) Harry Sinden, Canadian coach from ’72, was plainer in his Kharlamov praise: “He’s a helluva hockey player,” he conceded, later, after the series was over. There’s an argument (more or less sarcastic) to be made that the highest accolades conferred on Kharlamov by Canadians during his career involved elbowing him whenever the chance afforded itself, or slashing his ankle. Back in the 1970s, our admiration of his luminous skills was expressed in trying to erase them from the rink — we had no higher praise. But we won’t linger there. To end off the day’s Kharlamov miscellany, here’s an exchange he apparently had with Bobby Orr in late 1977. Orr was was not-quite-finally-retired from the Chicago Black Hawks at this point, though almost. Trying to rest his troublesome knees for one last effort to get back on the ice, he was serving the team as an assistant coach that winter when he travelled to Moscow to scout the Izvestia tournament. While he was there, Soviet Life set up an exchange between the two hockey greats. I don’t know how it went in person, but by the time it made it to the page, it was a stilted item indeed, and reads (fair warning) as though it were translated and possibly re-imagined by the dullest of overtired humourless staff propagandists.